Macy Miracle was one of many Northmor volleyball players to have good days serving the ball against Africentric on Tuesday. 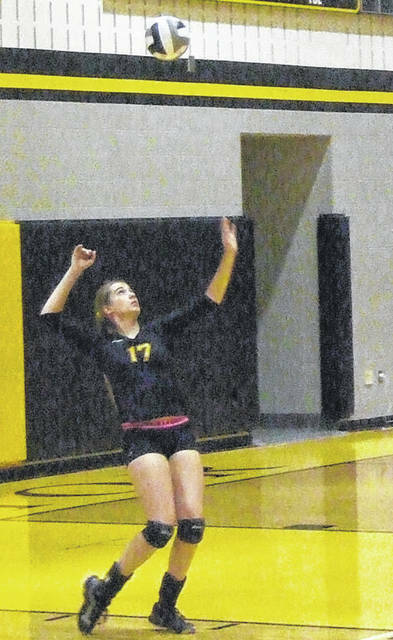 Northmor’s Anna Donner passes the ball after an Africentric serve in Tuesday’s sectional volleyball win. 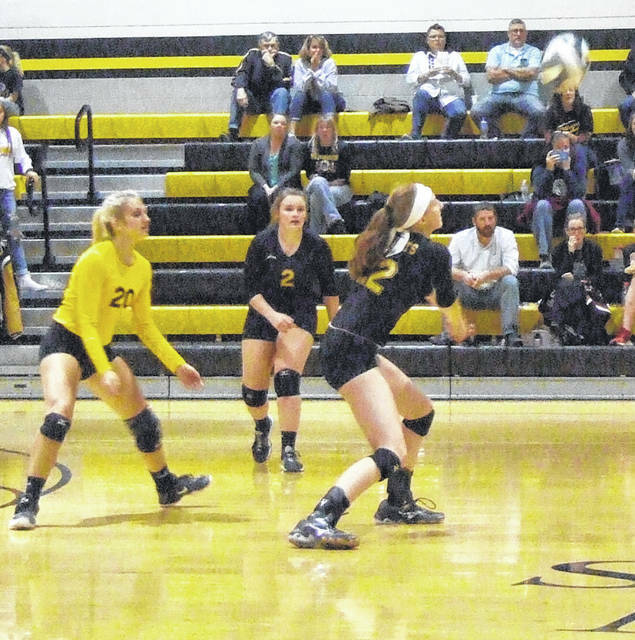 A fast start proved beneficial to the Northmor volleyball team Tuesday night when they opened Division III tournament play with a 25-6, 25-12, 25-8 win over visiting Africentric. In the opening set, the Knights scored the opening seven points behind the serving of Macy Miracle. They wouldn’t let up after that, getting three points from Hanna Bentley, two from Anna Donner and six from Abby Donner to lead by a 21-4 margin. Points by Aly Blunk and Lily Tate, as well as a pair of defensive points, gave Northmor a 1-0 lead in the sectional match-up. Northmor struggled a bit in the second set, as they struggled with Africentric’s size at the net, resulting in a number of blocks. While Bentley and Anna Donner both scored three points each and Leslie Brubaker added two, the Knights only led 13-12 when coach Kara Wright called a time-out. After the time-out, it didn’t take long for the Knights to turn things around. They tallied a quick defensive point to get the ball back with a 14-12 lead and Tate then served for 11 straight points to turn a closely-contested set to a 25-12 win. Wright noted that her team did a good job of serving in the match — a big positive as the Nubians struggled with serve reception. While the score was close early in the third game, the Knights relied on strong serving to blow open the contest. Leading 4-3, the team got six straight points by both Abby Donner and Blunk to lead 17-4. Miracle then added two and Bentley scored three points to close out the straight-set sweep. Wright noted her team got tested in aspects of their game they need to work on in the win. The coach feels that lesson will be useful on Saturday when the team goes up against Elgin in their second-round match-up, also at home. Statistically, Abby Donner finished with five aces, while Blunk had five aces and seven digs; Miracle tallied five aces, eight kills, eight assists and a block and Bentley finished with four aces, three kills and three blocks. Lily Tate contributed two aces, 10 assists and a block and Anna Donner had six digs, eight kills and eight assists. Also, Julianne Kincaid had six kills and Leslie Brubaker added six kills and a block.